This is a treat we enjoyed as children and we still enjoy today. Growing up in Southern Louisiana in the U.S. we had sugar cane and pecan trees everywhere. So we had an abundance of sugar and pecans. I know that some of you don’t have a way to get really good pecans but this recipe is also for peanuts or even walnuts if you have them. This is a treat we enjoyed as children and we still enjoy today. Now, this is a great recipe that can quickly be done in the microwave instead of standing next to a stove trying to get the syrup to come up to the crack stage. So hope you enjoy. In a 1½ quart glass microwave safe dish add sugar and corn syrup. Microwave on high 3-4 minutes (I do it 4 mins). Stir in nuts and microwave on high for 2-3 minutes (I check at 2 but go to 3 mins.) until light golden brown. DO NOT SCORCH the nuts, why I check at 2 mins. Mix butter and vanilla in well and microwave on high 1 1/2 minutes. Remove from microwave and add a teaspoon of baking soda. Stir until light and foamy. Pour onto a lightly greased cookie sheet and with the back of a greased spoon or spatula spread as best you can. I dump my candy onto nonstick foil but I’m not sure if you have access to that so a greased cookie sheet is fine. Allow cooling at least 30 mins to an hour. Break into pieces and store in a dry container. This looks super good. Going to try it. Oooo… I haven’t had good peanut brittle in ages. Thanks. I will try this. I didn’t know there was another way to make this. We have lots of pecans courtesy of my Southern brother in law. Very simple to make, Esme, and sounds rather yummy. 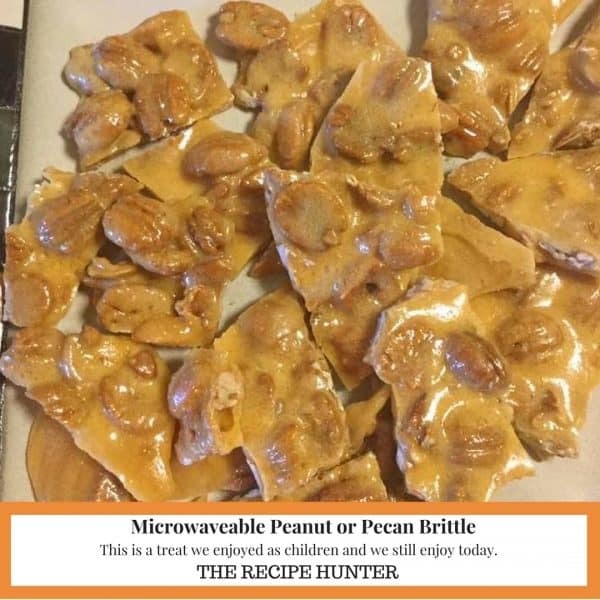 For sure easy to make and also a nice treat. Sorry Robbie, you comment landed in spam, but now un-spammed.